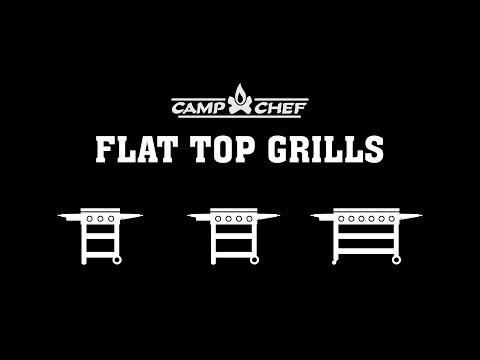 For the person who has more to cook than what they can fit on their stove, or the grill master who wants an egg on their burger, the Camp Chef 475 Flat Top Grill is the versatile and ideal solution for any outdoor cooking event. The 468 square inch, pre-seasoned, cold-rolled steel cooking surface features a splash guard to keep food on the griddle, and is evenly heated by three, 12,000 BTU stainless steel burners. The burners sit in a powder coated steel burner box and are independently controlled by three knobs on the front of the grill. As you cook, drippings will flow into the grease tray at the edge of the griddle top, and then funnel into the grease catch bucket. Two large, powder coated steel folding side shelves provide extra prep space, and two powder coated steel shelves under the grill provide storage space for tools or utensils. Micro-adjust griddle levelers and adjustable leg levelers insure that you always have an even surface to cook on. A hose, regulator, and holding bracket are included for a 20-pound propane tank (tank not included). Cooking Grid Dimensions 24 3/5 X 19"
I purchased this grill at the end of the season. It was on sale, and what a great deal it was. This grill is so well built. The flat top is made of cast iron and cooks evenly throughout. I would highly recommend it. Just set this grill up today. It was really simple and straightforward. It cooked some amazing tacos for us! Didn't realize it did not come with the grill grates like the 4 burner does. I was looking at that one for so long that I just assumed the 3 burner would too. If you ever made a grill grate accessory I would buy it!! Do any of the grill boxes fit this model? That would be great too. Thanks for an awesome product. Fast Cooking and Easy To Clean! I've never had a flat top grill, but I am sold on the way it cooks and cleans. Cooking is very fast compared to my covered cooker, and just scrape, season, wipe off the excess, and the grill is clean. Very compact! This will fit anywhere! Been using this griddle for the past month and have to say it is the perfect size for a family of 4. Good construction and even cooking temps. Would recommend. Where is the open flame grill? What is the width of the grill without the side tables? Hi, Vern. The grill is 24 inches wide without the shelves. 24 3/5 X 19" 31 25/32 X 19" 27 1/2 X 18" 27 1/2 X 18"